Processionary caterpillars are something that can be fatal to animals. You may think a caterpillar can do no harm to animals or humans but there is one that you may come across in warmer climates and there are reports of them being found in the South of England. It has two main names, the Processionary caterpillar or Pine Processionary Moth Larvae. Moths lay their eggs in pine trees and you can see the nests in trees as small tennis ball sized cocoons that look like they are made of cobwebs. During the winter, these cocoons develop into the larvae. The caterpillars become active and a risk from January to April. The amount and exact timings will depend on the weather conditions that year. When they leave the nest, they make their way down the tree following each other which is why they are called Processionary caterpillars. They are looking for food and you can see them in lines of lots of caterpillars usually rather than single caterpillars. It has been known for these lines to be many metres long, but others are 10-50 long depending on the number and location. So why are these caterpillars a problem? They secrete an acidic poison, which causes severe infections. Dogs are attracted to the caterpillars and they often playfully hit them with their paw or sniff them. This causes the caterpillars to secrete the acidic poison which causes a painful sting on the skin. To ease the pain the dog licks the sting, spreading the poison to the mouth where the poison causes severe tissue damage and effects the airway and respiration. If you suspect your dog has come into contact with them get them to the vet immediately. The signs are excessive salivation and signs of allergic reaction. The blood pressure will drop, and this can lead to shock and even death. The lounge will also appear to be swollen. Where a dog survives this initial stage, they often develop an infection of the lounge and or the throat and in time gangrene can occur which causes parts of the lounge to fall off or require removal by a vet. With first aid, the first thing to remember is that this toxin will hurt you as well so wear gloves and try to flush their mouth out with plenty of water and get them to the vet as soon as possible, calling the vet to warn them you are on the way. Some vets advise if you are travelling to risk areas to carry antihistamine tablets to try and slow the reaction before you get to the vet. If you are taking your dog to a risk area, do your research to find out what the risks are and where local vets are. Avoid taking them for walks in areas where there are pine trees, keep them on leads and do not let them sniff the ground. Muzzling dogs while you are out will avoid the toxins reaching the mouth. 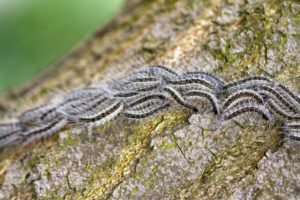 Finally, remember these caterpillars are not a real risk in the UK and trees can be sprayed to kill the caterpillars. They are more of an issue if you take your dog on holiday abroad.